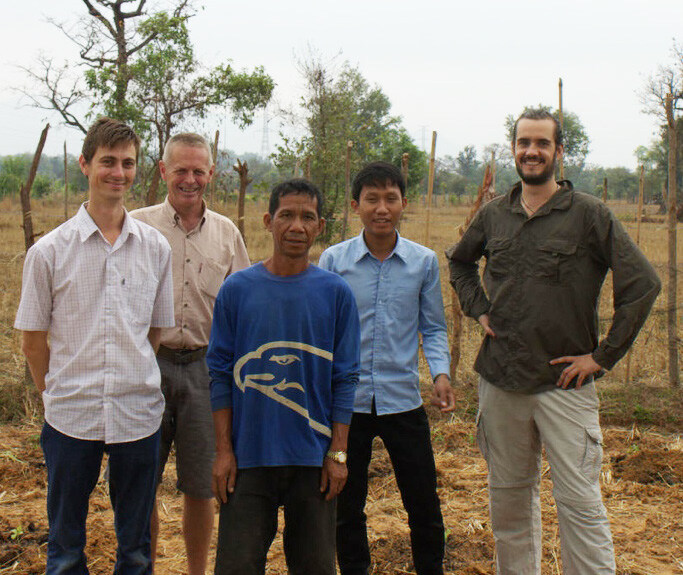 Ian Smith, AVID entomology volunteer (pictured below, left), trained staff from the Agricultural Section of the Provincial Agriculture and Forestry Office (PAFO), in Pakse, Laos. Read Ian’s report (below) on his work on integrated pest management between November 2015 and May 2016. During my time in Lao PDR as a volunteer entomologist, my role was to train local staff in entomology skills related to agriculture and trade. These skills included insect monitoring, identification and sampling. Insects collected from sampling that were believed to be economically important were sent back to Australia for positive identification and to assist in the development of a quarantine checklist. Some of the staff were unsure of the major insect groups as this information is unavailable or only provided in English. I therefore assisted in the production of posters, identification keys and power point presentations, which were translated into Lao. I was also involved in the identification of a storage pest of organic coffee. A coffee exporting organisation had approached us about a pest that had fouled shipments to Europe. As this group was producing organic coffee, they were not able to use insecticide to control the pest insect and were seeking other options. 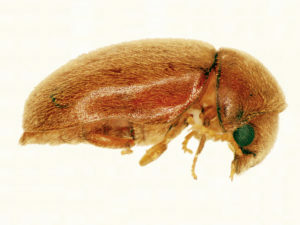 The pest beetle in question was taken back to the lab where it was identified as a cigarette beetle (Lasioderma serricorne). The identification of this beetle was beneficial to trade as it was used to recommend non-insecticide control methods, such as freezing and cooling in warehouses and to what temperatures. I ran a workshop to teach both local staff and border quarantine staff on the use of dichotomous keys and the identification of major insect orders. This required the transliteration of both insect order names and descriptions into Lao script—something that was not formally available within the district or even further afield. A second presentation was produced for an information session for smallholder coffee farmers on the control of the white stem borer. This pest species kills coffee plants and is a serious community problem; if one farm is not managing the pest, it can result in increased populations for surrounding farmers. This presentation was left for staff to present to farmers as needed. These training activities have increased the capacity of local staff to understand the basic invertebrate groups, which is a requirement for undertaking any form of pest control program or quarantine system. The training will also help Australia, as it provides a starting point for the development of agricultural trade with southern Laos—the training in pest insect monitoring potentially increases the production of crops, and the quality of exports. The improved capacity of quarantine staff will decrease the risk of invasive pests entering Australia either via migration through South East Asia, or via imported goods.